Copper cookware is a big investment, so the last thing you want to do is mistreat it. Here's what you need to know about properly cooking in copper pots and pans, cleaning them, and restoring worn tin linings. With the price of copper as high as it is, the last thing you want to do is invest in expensive copper cookware only to mistreat it into disrepair. Treating it right is relatively easy, as long as you know a few key things. Here, I'll go over some important details when cooking with copper, as well as tips on how to clean it and when to have it fixed up by a professional. 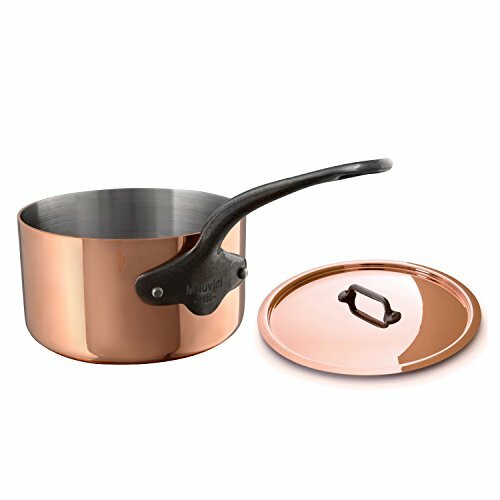 The main thing to keep in mind is that, aside from jam pots and a few other specialty pieces of equipment, all copper cookware is lined with another type of metal. That's because copper is reactive and, in large enough doses, toxic. An inert metal lining keeps the food from touching the copper. You will need to treat your pans differently depending on what kind of lining your copper pots and pans have. Traditionally, the metal lining was tin, and a few producers dedicated to maintaining that older practice, such as Jim Hamann at Duparquet Copper Cookware (he served as a primary source for this article and also runs a copper refurbishing and re-tinning service called East Coast Tinning) and Brooklyn Copper Cookware, continue to sell tin-lined pots and pans. Today, most other copper pan manufacturers line their pans with stainless steel, which is far more resilient than tin but not nearly as nonstick (for more on the differences between tin- and steel-lined copper pans, be sure to read our larger guide to copper cookware). The copper exterior, meanwhile, has its own needs, different from both tin and stainless steel. The good news is that, when maintained well, copper cookware can last for generations. Copper is a highly conductive metal, which, among other things, means it's very energy efficient—by conducting heat well, it heats quickly and evenly, and it cools down just as fast. This makes it one of the most responsive and sensitive metals for cooking. There's really only one heat source you want to use copper on: gas. Electric cooktops are too slow to shift temperature, negating any advantage copper offers; it'd be like trying to stream Netflix over a dial-up internet connection. And, with few exceptions, copper does not work on induction. When cooking with copper over a gas flame, you should generally err on the side of a more gentle heat than you're used to. Once again, this is due to copper's superb conductivity. It can do a lot with a much smaller thermal input, so go slow. If your pans are lined with tin, you have to be especially careful with high heat. Tin has some very desirable traits, its natural nonstick surface top among them. But its melting point, at about 450°F (232°C), is very low. That's a temperature an empty pan can easily reach over a gas flame, and if it does, the tin can bubble and melt, and you'll require the services of a re-tinner to get the pan back to working condition. To prevent a tin-lining mishap, always preheat your tin-lined copper pans with some kind of fat in them, like butter or oil: If they start smoking, they're getting close to the danger zone. Once food is in the pan, it's much safer, as the food itself will prevent the pan from overheating. Stainless steel–lined pans don't offer the nonstick benefits of tin (in fact, they're one of the worst offenders in terms of food adhesion), but they are much better at handling high temperatures. You can accidentally let a stainless steel–lined pan get crazy hot and most likely nothing bad will happen (though it's not impossible, with enough abuse and a little bit of bad luck, for the steel lining to decouple from the copper shell...a problem that can't be fixed). A lot of sources will tell you not to use metal utensils in tin-lined pans, once again due to tin's fragility. This is advice I only half-follow, since I find it pretty hard to avoid using the occasional metal whisk and slotted offset spatula when cooking. I'm pretty careful with them, though I suppose I probably am shortening the lifespan of my tin linings. You can decide your own risk tolerance in this area (but if you do end up scratching away your tin, don't say I didn't warn you!). For stainless steel linings, you can knock yourself out; metal tools aren't going to do anything to the lining beyond very minor surface scratches. Just as with cooking in copper, how you clean it depends on the lining. Thanks to tin's largely nonstick qualities, very little food is likely to adhere to it, and if it does, it won't do so stubbornly. Filling a tin-lined pan with water, adding a little dish soap, and leaving it to simmer is often enough to free any stuck-on bits, which can then be wiped away easily. Avoid at all costs strong abrasive scrubbers like steel wool and many sponge scrubber pads (though a light hand with Scotch-Brite's nonscratch scrubber shouldn't cause too much trouble). Keep in mind that tin naturally darkens with heat exposure, and that's not a problem that needs to be scrubbed away. Stainless steel liners can be scrubbed and scoured just like any stainless steel pot or pan. See my guide here. The natural patina on copper is prized by many. For the copper exterior, you have a handful of choices. First, it's good to know that the natural patina copper develops over time is prized by many. Walk into a copper enthusiast's kitchen and, in a moment of goodwill, decide to polish all their cookware before they return home, and they may poach you in the gleaming soup pot you present to them. This is good news: You don't have to polish your copper cookware. You can just let it grow...more beautiful. But there's a difference between a well-developed patina and burnt-on crud. Spills and drips that fall down the exterior of the pan and then burn on are not generally considered a hallmark of a beautifully aged pan. If you do dribble food, make sure to wipe or wash it off before it has a chance to singe on. Stubborn burnt-on crud on the exterior of this pot required a serious polishing; after, it was as good as new. If, despite the appreciation many have for the patina of aged copper, you'd rather have yours gleaming like new, you'll need to polish your pans from time to time. Hamann recommends Twinkle as an effective retail product, while recipes abound for more natural pastes made from an acid, such as lemon juice or vinegar, and an abrasive, such as salt. Many also swear by Bar Keepers Friend as copper polish (I love it for stainless steel, too); the company has a tutorial on its website for cleaning copper using its product. If all else fails, you can always send your pot off to a professional for cleaning. Read on for when to seek a pro's help. Re-tinning a copper pot's interior in three stages: before, after stripping out the old lining, and finally with the new tin lining. Aside from getting the copper professionally polished, the main reason to seek a professional's help is to have the tin lining on a well-worn copper pot replaced. According to Hamann, a little copper peeking through the tin lining here and there isn't a problem. He says you should only send your pan off for re-tinning when the combined area of copper showing through the lining adds up to an area roughly the size of a US quarter. Melting new tin into a copper pot. To re-tin a pan, the old tin lining is stripped out, exposing all the copper below. Then new tin is melted into the pan over very high heat and wiped into an even coating. With care, a tin lining should last at least 10 years, if not longer. Stainless steel–lined copper pans, of course, do not require this occasional upkeep.